At the top of Grapevine Canyon, the adobe buildings of Fort Tejon State Historic Park guard a beautiful tree-lined meadow. 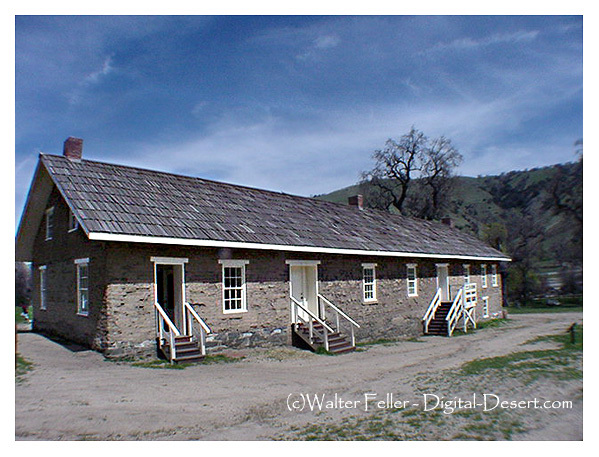 Fort Tejon, at an elevation of over 3,500 feet, is situated in the rugged Tehachapi Mountains near Tejon Pass on I-5. Due to the semi-aridity of this region, summer temperatures are often in the high 80s and low 90s, sometimes reaching into the 100s. Winter temperatures can get down to freezing, with the possibility of snow. Grapevine Canyon is known for occasional strong winds. The fort was established to protect and control the Indians who were living on the Sebastian Indian Reservation, and to protect both the Indians and white settlers from raids by the Paiute, Chemehuevi, Mohave, and other Indian groups of the desert regions to the southeast. Fort Tejon was first garrisoned by the United States Army on August 10, 1854 and was abandoned ten years later on September 11, 1864.